The days of poorly insulated and drafty entry doors are quickly coming to an end with the popularity of the insulated steel door. Steel door manufacturers maintain that a storm door is not necessary and even go as far as voiding their warranty if one is installed. Entrance enclosures provide all the benefits a storm door gives and much much more, without voiding the steel door warranty! Many homes have been built with a roof or second floor sheltering the main entrance. These porch areas typically have one or more openings with either a square or curved top. Entrance enclosures are custom fabricated glass panels and doors made from 1 3/4" aluminum rail specifically designed to fit into these existing openings. If your home does not have an alcove, you can still have an enclosure! Many of our independent dealers are able to provide flat and curved glass roofs. We provide our dealers with the components to make angled sidewalls and arched or curved top window panels! Extra space for boots, coats, plants or people! Each panel is fastened together with special connector pieces to form a wall. 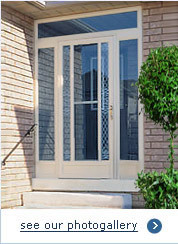 The storm door(s) are mounted to this base providing a doorway. Unlike similar looking 3 season Florida room walls, which are engineered for support strength, our entrance enclosure system is designed with have slip channels able to adjust to uneven and out of square walls and floors which makes for a tight well sealed and good looking installation. Our enclosure system is particularly suited for curved and angled applications. Beautiful and functional, complete with operating windows and doors, these enclosures are a handsome enhancement to any home! Width 39 1/2" to 82"
Width 70" to 117 1/2"
Width 74" to 161 1/2"